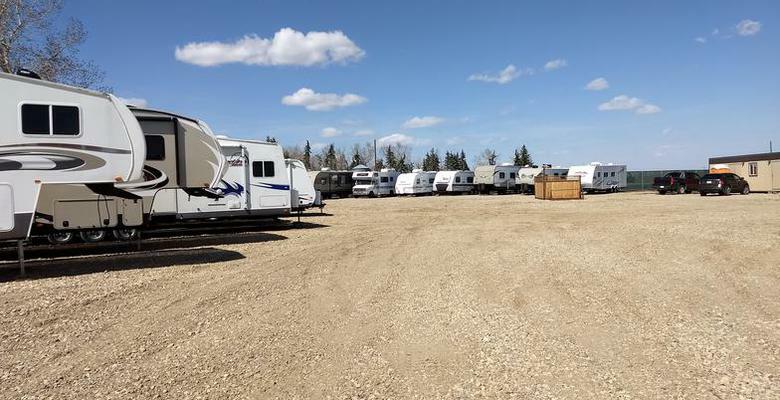 Welcome to Big Sky RV Storage Ltd.
Just minutes from Calgary , close to Cross Iron Mills . If you’re looking for a clean RV and Boat storage facility, you’ve come to the right place. At Big Sky RV Storage we’ll give you the attention and personal service you’ll come to expect. We offer the best in RV and Boat storage and services such as 45 degree angle parking, 12 ft wide stalls, 30 ft lane way to accommodate even the biggest of RV'S, we also have dump tanks for your convenience . Big Sky RV Storage is located on the south corner of the 566 and RR 285 ,( Balzac) east side . Let us help you with all your Boat. RV and trailer needs. We are proud to associate ourselves with SWIFT RV repairs, certified RV and trailer technicians that can look after all your service needs. No one wants a leaky roof let Swift RV Repairs check over your trailers roof at no charge. Looking for a great location to store or relocate your trailer ? We have over 300 spots available . Book Now to reserve your site and get that piece of mind that only comes when you know you have a stall booked. In association with Big Sky Self Storage,( bigskyselfstorage.ca) for all your indoor storage needs.